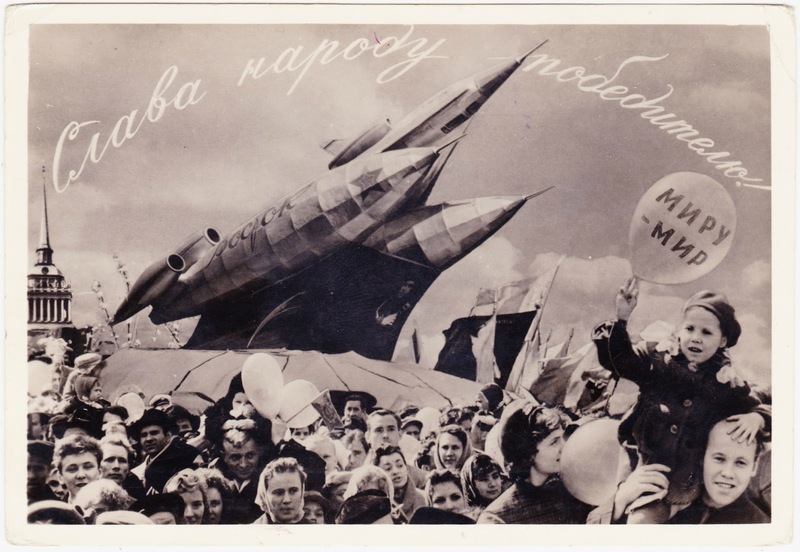 For the final installment of this week's Ephemera for Lunch, here's a fascinating Soviet Union postcard from 1961, the year of Yuri Gagarin's pioneering human spaceflight aboard Vostok 1. The caption across the top, if I've translated it correctly, reads "Glory to the victorious people!" And the little girl's balloon states either "World Peace" or "Peace to the World." Meanwhile, that's one hell of a rocket ship in the background. I'd love to know more about it. I'm pretty sure it's not Vostok 1 or even a replica of that ship. Here's the reverse side of the postcard, which was written on but seemingly never mailed. It would be great if someone could translate it. 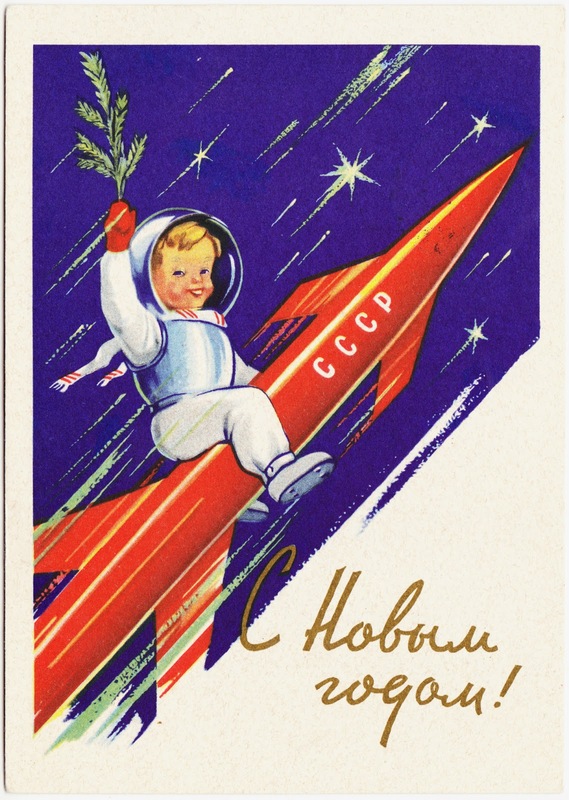 The cursive text on the card reads С Новым годом!, which means "Happy New Year!" 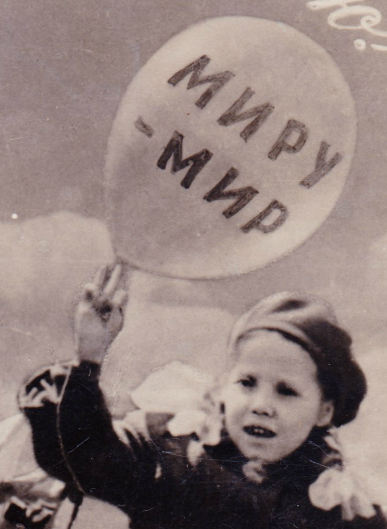 During the time of the Soviet Union, Christmas celebrations were abolished. So the end-of-year holiday that took its place in importance was New Year's Day. 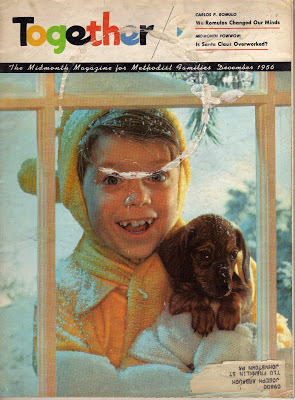 Elements of the country's culture and folk traditions were woven into that holiday and appeared as themes on the cards that were mailed and exchanged in the mid 20th century. Shown above is the back of today's postcard. 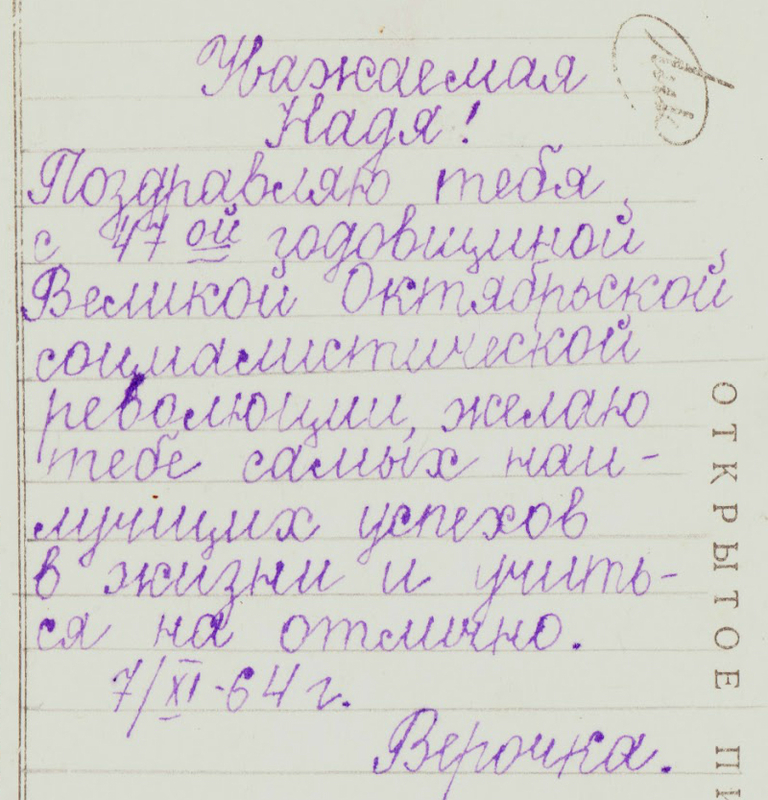 I'm not going to make an attempt at translating all of that cursive Russian. If you can read Russian and/or want to give it a whirl, leave the translation down in the comments section. Meanwhile, here's a closeup of the pre-printed postage on the back of the card, which also has a rocket theme. 1. Maybe he's a Time Lord and thus doesn't need the kind of protection that a human being would require. 2. Papergreat previously featured a С Новым годом postcard in December 2012. 3. For more on Russian New Year traditions throughout history check out this article on RussianFoods.com. 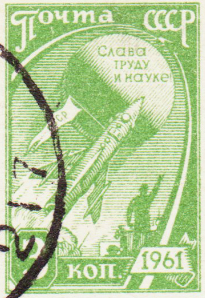 Also featured there is another nifty rocket-themed Soviet postcard. There's lot of great stuff this time around from the readers. One of the neat things about this blog is that it leads me to cross paths with great people who are as passionate about their hobbies as I am about books and ephemera. Papergreat's star-studded 200th post (plus some chickens): One of the items in that multi-part August 2011 post discussed the All-American All-Methodist football team, as selected by Fred Russell for the December 1956 issue of Together magazine. "About those Together magazine Methodist all-America football teams: Russell named them for eight years, from the 1956 through 1963 seasons. He continued to select both 'University' (major college) and 'College' (small-college) squads. These were always two-way elevens; it was during the single-platoon era of college football. He would usually name first and second teams, though in the first year or two he also selected third-team and honorable mention players. "The biggest problem for Russell was, there just weren’t that many Methodist institutions playing big-time football, so his University teams were drawn from a fairly shallow pool. (Although when that pool included Syracuse greats like Jim Brown, Ernie Davis, and John Mackey, it feels a little fussy to complain.) USC was also a strong resource in that pool, but after that first year, Russell didn’t include any Trojans in his selections. This wasn’t explained; perhaps Russell thought about it, and decided that historic ties alone with the Methodist Church didn’t warrant keeping a school in the mix. "The U. of Denver dropped football after the 1960 season, and that would have left only five schools to draw the University team from. But Russell took two teams that he had drawn from for the College team in 1956 and 1957 — the U. of Chattanooga and the College of the Pacific — and from 1958 considered them major college football programs, contributing to his University team, instead. That was a bit of a stretch, though Chattanooga and Pacific definitely played more up-market than a lot of the really small schools that Russell drew on for the College team. But that ultimately left Russell drawing from seven schools for his University team — still low, but viable, I suppose. "There were a lot more Methodist schools with small-time programs that he could select his College team from. He wrote that about 44 Methodist colleges played ball at that level, and over the eight years that Together published the teams, he named players who were from 35 different schools. So, it was fairly competitive to get named to the College team. "Finally, Russell’s selections carry some weight, because of his reputation. A friend and protégé of the great sportswriter Grantland Rice, Russell had a very long career himself, working as a sports journalist for 70 years, serving as sports editor of the Nashville Banner for decades, and being, arguably, the dean of Southern sportswriters in the 20 or 30 years before he retired at the very end of the 20th century." 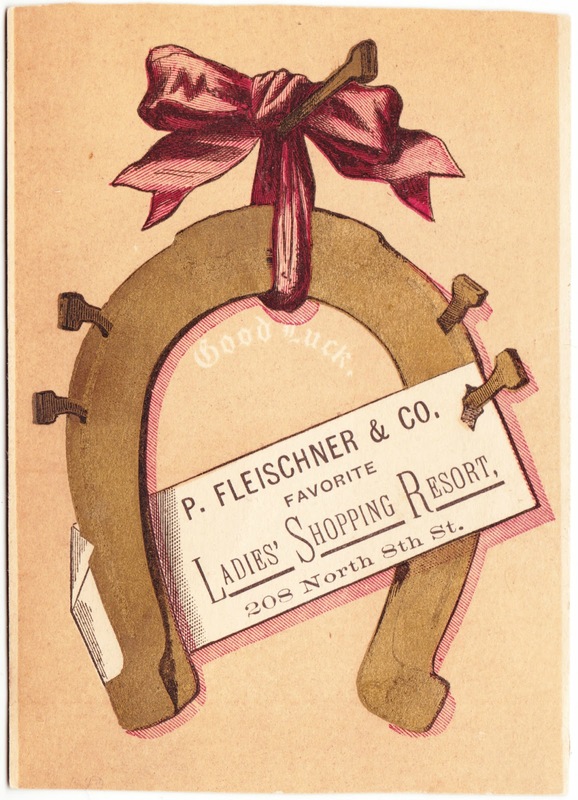 Ephemera for Lunch #10: P. Fleischner & Co.: Anonymous writes: "I can see why they were unsuccessful. The horseshoe should always be hung up as a 'U' or the luck will run out." As it turns out, there are multiple schools of thought on horseshoe hanging, and it can depend upon the culture or part of the world in which you live. Indeed, in many places, especially the United Kingdom and Ireland, the prevalent superstition is to hang the horseshoe upward, to keep the luck from running out. In other parts of the world, the idea is to hang the horseshoe with the open end facing downward. That would serve the dual purposes of pouring good luck on all those who enter and also keeping witches out. Which is important. I guess, if you wanted to cover all your bases, you could just hang two horseshoes side by side. One up. One down. There doesn't seem to be a rule against that. For Good Luck ... Do You Hang a Horseshoe with the Open End Up or Down? New England Folklore: "Horseshoe Magic: Secretly Pleasing to the Devil?" "Prinzess Victoria" and a tiny old package of sewing needles: "Unknown" writes: "Interesting! I have a similar packet of needles, similar but not identical. The portrait is slightly different, and they are marked 'PRINCESS VICTORIA,' no country of origin, but found in an antique sewing kit that was made in Austria." 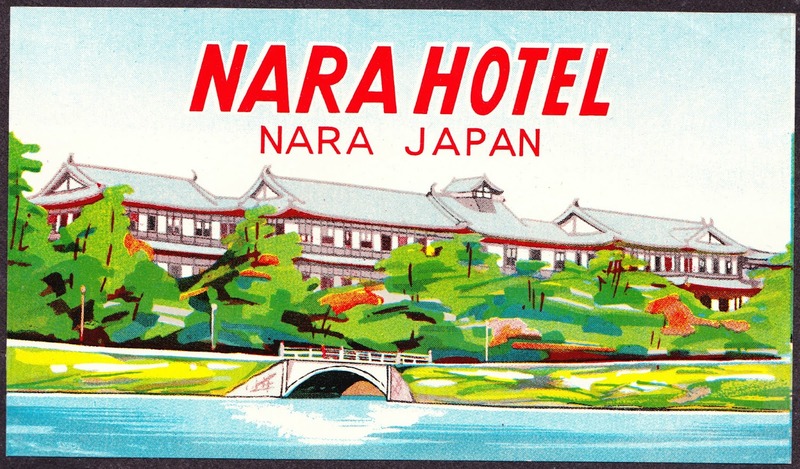 Ephemera for Lunch #24: Nara Hotel: "ltl" writes: "I got a coupla old luggage tags from a Japanese hotel not long ago via the mostly-postcards auction site Playle's — [No. 1 and No. 2.] — I was buying a buncha luggage tags to slap on my laptop (thought it'd be funny) and maybe decoupage to dresser drawers or somethin'. Haven't decided yet." Cool! I can see how the colorful vintage tags would make for excellent decorations. "I recently ran across your waybill post on Papergreat and am very interested in the content of those bills. "I lived in Coudersport from 1955 to 1969, and for the 55-56 school year we [lived] right next to the girder bridge. The speeder shed used by the maintenance crew was also next to our yard, just off the end of that bridge. "Now that I am retired, I am gradually working out how to build an HO scale layout featuring the C&PA as it might have been in the '50s had the west end of the line not been washed out in '42. Those waybills can give me a better idea of what was actually being transported and what rolling stock was in use at that time. For example, on the bill you posted, B&O 266155 is most likely a 40' steel boxcar, one of the 14,000 similar units built for the B&O. "In addition to the cars and freight, I am interested in the source and destination of those shipments. You listed the load of stone to the state highway department. I also know there was a tannery, a toy factory, a glass factory, a silk mill and a truss factory that may have received or sent up to full carloads. I have even found one picture of D-2, the second GE-44 switcher, moving a tank car onto the tannery spur sometime around '54." What a neat project! I'm happy to help in a small way. I'll be mailing Bob the small stack of Coudersport waybills that I still had, and I hope they help with his model railroad setup. 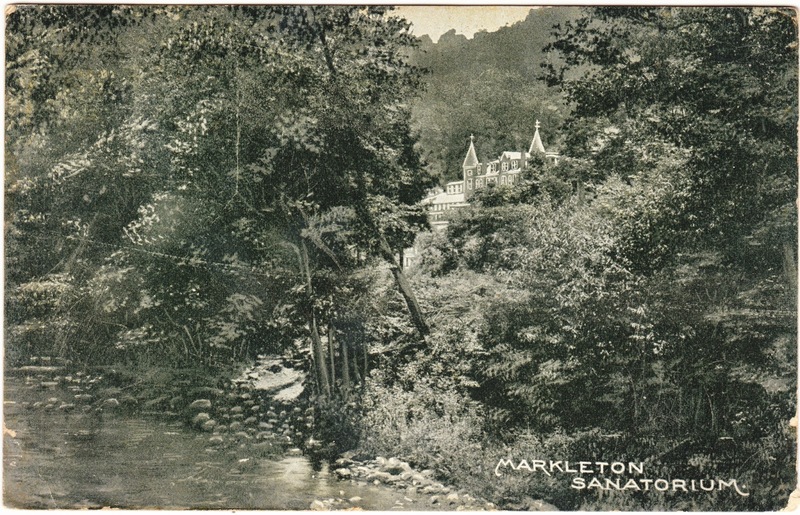 Old postcard featuring Markleton Sanatorium in Somerset County, Pa.: Anonymous writes: "The building is not there, I'm trying to find the coordinates so I can visit myself. I know I'm close, but I can't tell where the building was." I also had a reader email me earlier this year to say that: "Markleton [is] a fascinating little village. I spent a great deal of time there as a youth, lived there a few years, and still visit often. The sanatorium is no longer there, barely a remnant still exists, but that and former history of the village is intriguing." I haven't made it to the Markleton area yet this year, as I hoped to do when I first wrote about it back in January. Maybe I can get out there before winter hits. Otherwise it will have to go onto the 2016 list. A fellow fan of Ruth Manning-Sanders: As you probably know, I have an extreme interest in All Things regarding author Ruth Manning-Sanders. It's not an interest that many people share, though some people in my generation fondly remember her folk-tale collections, even if they don't specifically know her name. So it's always gratifying to come across someone else who does know her name. And, in this instance, I was able to reunite someone with a "lost love" from their childhood. 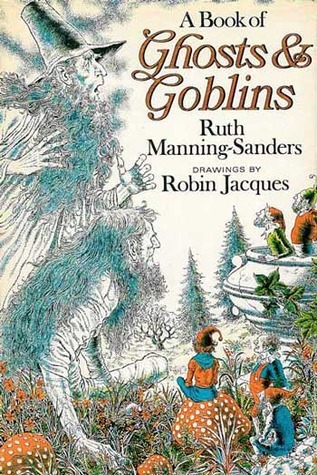 I will never get over the loss of my copy of Ruth Manning-Sanders' A Book of Ghosts and Goblins. It turns out that I had a second copy of that very book on my shelf. And there was zero doubt that I had to get it the hands of Marjory, who would clearly cherish it. "A little over a week ago, I tweeted about the loss of one of my favorite books. I've loved that book since childhood, when I first checked it out of my elementary school library and then renewed it again and again (and again). The librarian gifted that copy to me upon my graduation with the checkout card still tucked into the pocket. I had been the only person borrowing it for almost two years." "After I lost my book, I discovered that the author's entire (and prolific) bibliography was out of print. I was gutted, not only for myself, but also for all of the lovers of folklore and fairy stories, young and old alike, who would never experience the same rush of wonderment and delight I did when I first turned those yellowed pages." "Today, I received a package in the post. A fellow fan of Ruth Manning-Sanders' work found my tweet and sent me a used copy of that very same edition of A Book of Ghosts and Goblins I fell in love with so many years ago, beautiful dust jacket and all. As if that weren't enough, he also included two more Manning-Sanders books I've never read. The copy of A Book of Ghosts and Goblins has an inscription on the flyleaf, scrawled in crooked cursive by a previous owner, a little girl named Jennifer. The other two books are both school library books borrowed by generations of children, checked out as early as 1974 and as recently as 2006. All three feature Robin Jacques' magnificent and beautifully detailed illustrations." "It feels only right that all of these books are used. They were read and owned and loved by so many other people before they fell into my hands. It feels only right that all of these books are gifts, just like that first copy from my librarian, given for no reason other than, as the sender wrote, 'Sharing books is one of the things that makes me happiest.' Now that her books are no longer in print, there's something beautiful about sharing what we do have, 'helping others discover ... or rediscover ... her.'" "It feels like coming home." Colorful bookplate inside "The Golden Porch"
It's been a way honkin' long time since I posted a vintage bookplate. 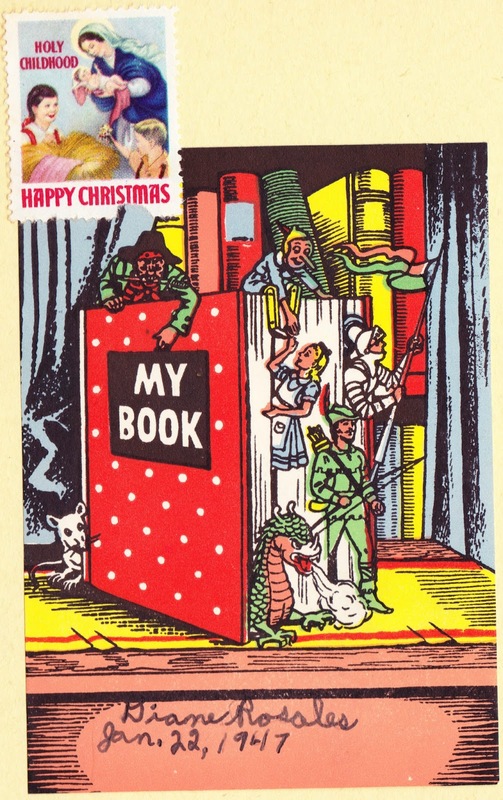 So here's one — and it comes with a vintage "Happy Christmas" stamp as a bonus. 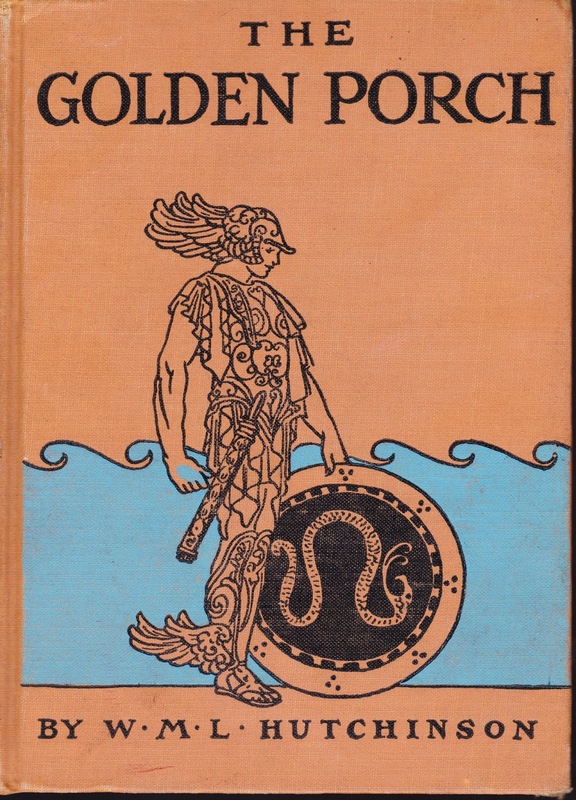 The bookplate is within 1925's The Golden Porch: A Book of Greek Fairy Tales, written by W.M.L. Hutchinson and published by Cadmus Books. The name "Diane Rosales" is written in neat cursive on the bookplate, which is dated January 22, 1947. The dragon and Pinocchio (helping Alice) are particularly cute aspects of the "storybook come to life" illustration. If you're interested in doing bookplates for your own book collection, a great place to start might be the free downloads offered by British author Anne Fine at her My Home Library website. There are awesome bookplates in all shapes and sizes, featuring the work of professional artists and illustrators. It's an awesome resource that Fine has put together, and all you need is a color printer! First up is the nifty logo for Cadmus Books. 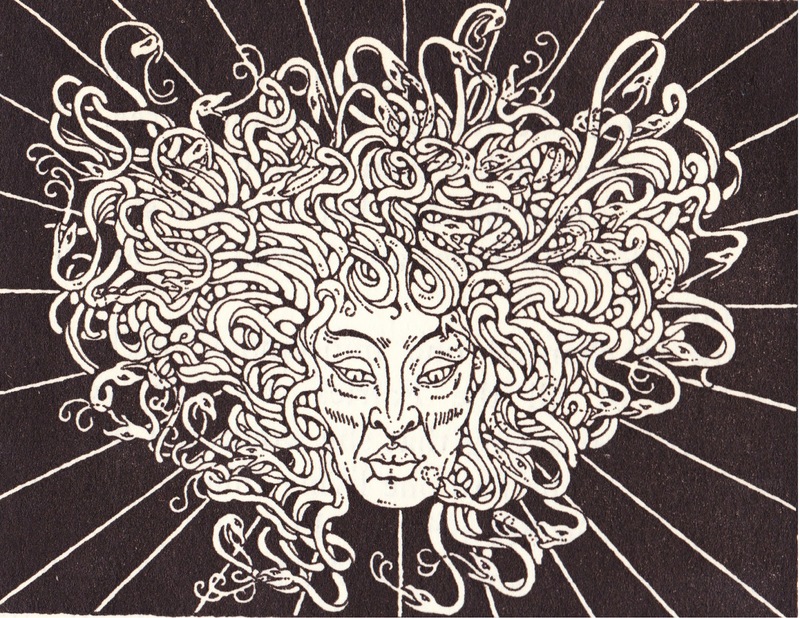 And second is this Dugald Stewart Walker illustration of Medusa. Coincidentally, Walker is remembered partly for the individualized bookplates that he designed on commission. Some of these can be viewed at the Library of Virginia's Virginia Memory website. Today's Soviet-era postcard was published in 1967, the year of that country's Soyuz 1 manned spaceflight. 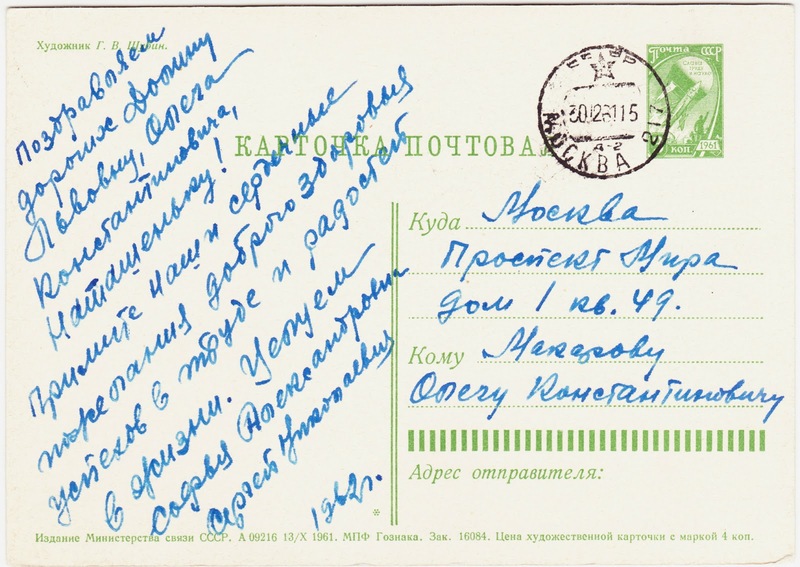 The postcard has never been used, and there is very little text or information on the back. The artist is Y.A. Vasnetsov (Ю. А. Васнецов) and the artwork, simply titled "Goat," was created in 1956. 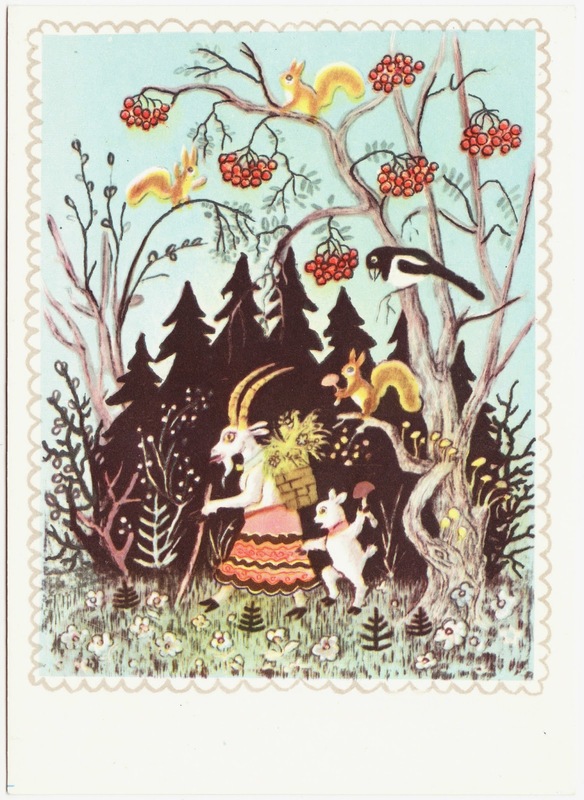 His full name was Yuri Vasnetsov (1900-1973) and I found a couple of excellent websites with biographical information and many fine examples of his work. "[E]arly books brought him a reputation as one of Russia's leading artists of children's books. In this period he also created lithographies using the same fairy tale themes as the illustrations. Due to the war, in 1941 Vasnetsov was evacuated to Perm, where he worked in the puppet theater, then in 1943-45 he moved to Zagorsk where he became chief designer at the Institute of toys. ... In the postwar years Vasnetsov continued to be very active as a book illustrator, working on children's stories, fairy tales and folklore collections." "He preferred to work on a fairy tale, folklore, folk rhymes. His best books live in two dimensions of real and fantastic, the most mundane things become in them a fabulous character, the most improbable events become easily acceptable. 'Raven sits on the oak and plays the pipe' – requires a special gift to this verbal way to make visible and, moreover, as compelling as in a fairy tale. ... In his drawings connected innocence and wisdom, trust in the world of simple things, simple human feelings and actions, where good – is really good, and never turns evil." 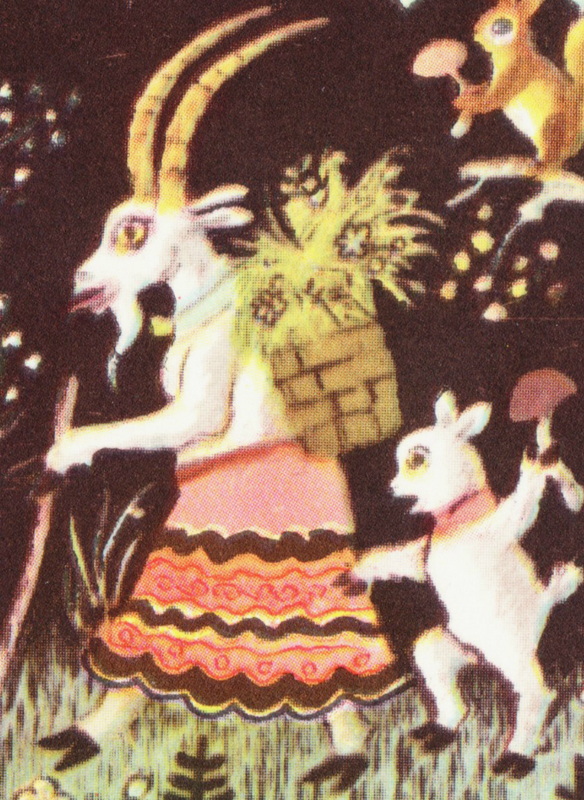 Here's a link to another Vasnetsov goat illustration. And here's one more. 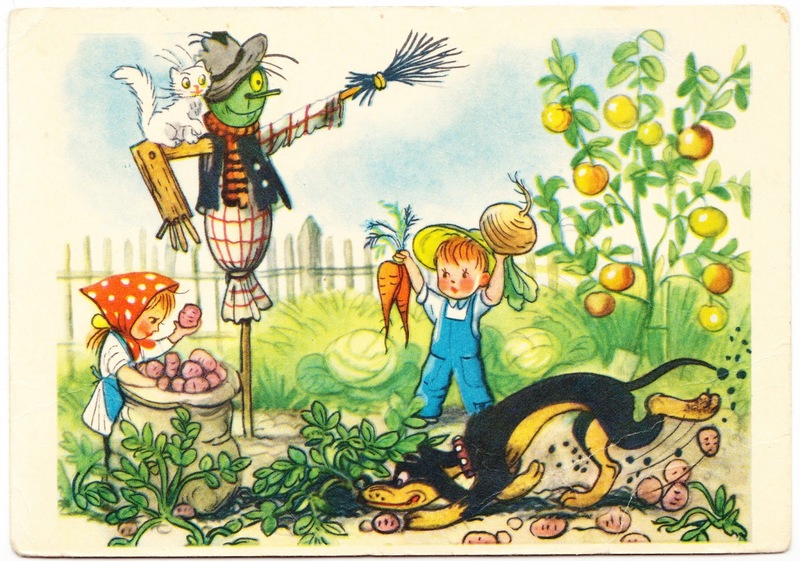 This postcard was published in the Soviet Union in 1974. In that year, with Nikolai Podgorny as head of state, the Soviets conducted 21 underground nuclear tests1, launched a military space station, and saw the domestic release of the motion picture The Red Snowball Tree. 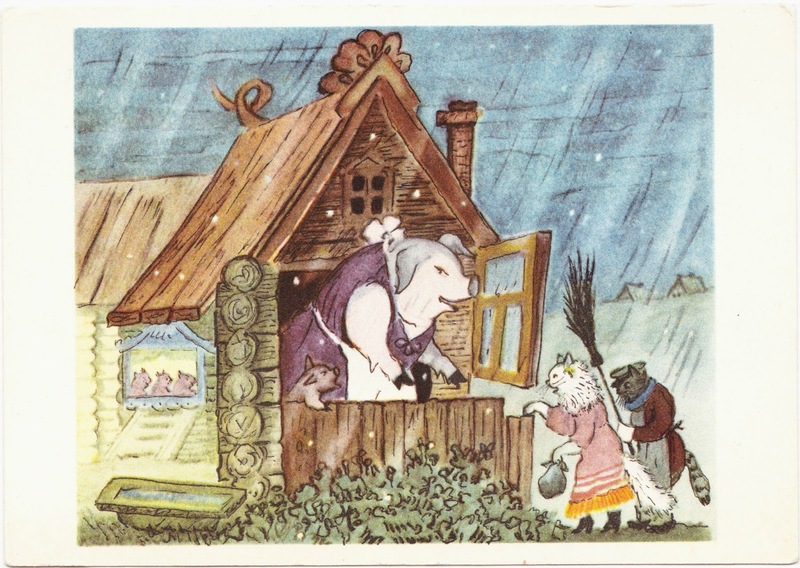 In this illustration, there is a small wooden house with a mother pig and several piglets inside. Standing outside are what appear to be husband-and-wife cats, carrying a broom and a small bag. I was left without shelter. I will rock your piglets. From a cultural perspective, I'm not sure if there's supposed to be anything humorous about this. Or perhaps we're just supposed to take it as a straightforward tale of the poor offering their services to the middle class in exchange for basic life necessities. P.S. — Did you notice that the roof seems to have a pig tail in the back? 1. The United States was also conducting numerous nuclear tests in 1974, of course, under Operation Arbor and Operation Bedrock. Lubok cat: "He lived sweet, ate sweet and farted sweet"
I stumbled across this image earlier, while researching today's postcard, and it was just too good not to share. Plus, I'm not sure I'll ever get the word "farted" into the headline of a post again. Sarah will be proud. This is a lubok, which is the name of a type of Russian popular print. The word lubok comes from lub — the type of board the illustrations were printed on. They were cheap, colorful and plentiful and could be used to decorate the homes of the middle and lower classes. According to Wikipedia, this is an eighteenth century piece of folk art titled Cat of Kazan. 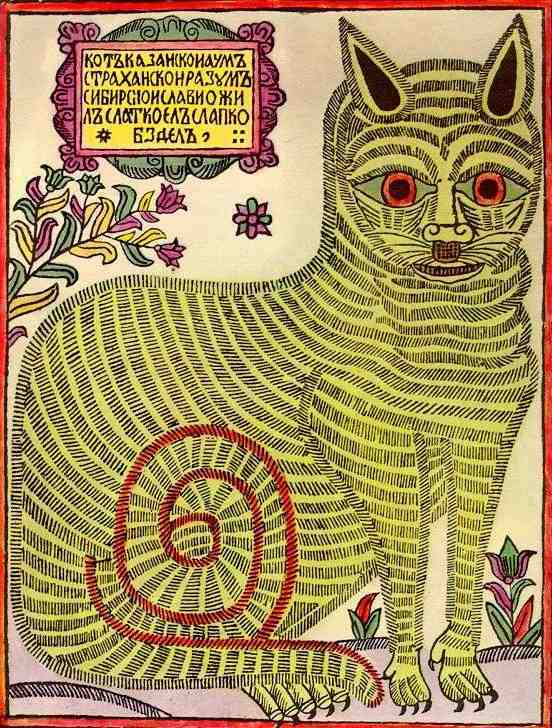 The text translates to: "Cat of Kazan, mind of Astrakhan, reason of Siberia, he lived sweet, ate sweet and farted sweet." Luboks were often a form of satire. This one might have been poking fun at Peter the Great. For more about this art form, see this article by Alexander Boguslawski and a 2014 blog post by Pagefiddler. P.S. — "Farted" in Russian is пукнул. I had to use Google Translate to get through the printed text on the back of the postcard. Chupka helped Masha dig the potatoes very well. Ivan went to pull the carrot. And Cirrus helped nobody; he became friends with Steppe the scarecrow and did not leave him. So the subtle lesson, perhaps, is that cats did not fit in well and do their required share within the Marxist–Leninist state.